The British were sensible of their advantageous position. They were already looking to march on the rebel capitol of Philadelphia. Once they had taken Philadelphia the war would be won, and the members of the so-called “Continental Congress” would be tried for their treason and made examples of. All they had to do was wait; the Delaware River would be frozen solid soon and they could simply march across and take the city. Somewhere between the 17th of December, when George Washington wrote in despair to his cousin, and the day of the 24th he had an idea. It was a mad, dangerous, and quite likely impossible idea. 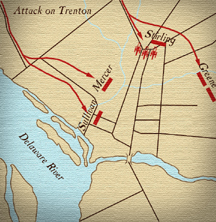 Washington would take his remaining troops and attempt a surprise attack on the enemies’ Hessian mercenaries, camped on the opposite side of the rapidly freezing Delaware. It’s hard for us to imagine just how desperate the situation was or how wild the idea of attack must have seemed. The artist Charles Wilson Peale described his viewing of the army gathered on the banks of the Delaware like this, “A man staggered out of line and came toward me. He had lost all his clothes. He was in an old dirty blanket jacket, his beard long and his face full of sores… which so disfigured him that he was not known to me at first sight. Only when he spoke did I recognize my brother James.” How could these men (boys most of them) be expected to go into battle? The Hessians they would be facing were well disciplined and universally feared professionals. The only hope was a surprise attack. The attack was to have three parts. 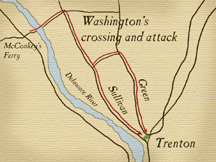 Generals Ewing and Cadwalader would cross below Trenton, and Washington’s troops ten miles north of the city. They would assemble before dark and sneak across the river, arriving to attack the enemy together at 5:00 AM. The officers were ordered to wear a piece of white paper in their hats so that their troops would easily see and follow them. Sixteen-year-old fifer John Greenwood wrote in his memoirs of that Christmas day that everyone was issued a weapon, even musicians like himself. “I had then a gun, as indeed every officer had. Every man had sixty round of cartridges served out to him…none but the first officers knew where we were going or what we were about, for it was a secret expedition.” The boy Greenwood had arrived only two days before, one of 100 survivors returning from the failed campaign in Canada. The plan began to fall apart immediately. They arrived at the crossing point too late, the weather bad with heavy rain, hail and freezing snow. As he left his quarters for the crossing point, Washington was approached by a young Major who carried a letter from General Horatio Gates. Gates claimed he was too ill to participate in the attack. In fact, Gates had gone to Philadelphia to try and undermine Washington before Congress. (The Major at least went down to the river to volunteer for action.) The ice began to grow thick in the river, and the water was rough from the wind. Both Ewing and Cadwalader failed in their attempts to cross the river. The situation, desperate to begin with, had actually become worse. At the Birmingham Crossroads Washington divided his troops. They would attack from different sides, still hoping by some miracle to surprise their enemies. About this time it was discovered that their flints and powder had gotten wet and were probably ruined. The men asked what was to be done; Washington replied, “Advance and charge.” The battle that followed was brief. Twenty Hessian soldiers were killed, 100 wounded and 1000 captured. Only four of the patriot forces were wounded and none was killed. After so many months of defeat and despair, a victory. For Americans, this is the other Christmas story. It has become the subject of stories and art and reenactment. It’s so far from the way we spend our Christmas today that we can scarcely imagine what it was like, so foreign that we could easily believe it a myth. The reality of that day changed the patriot cause forever. It showed the Patriots of 76 that they could win at a time when belief was at its lowest and hope seemed foolish. It told the world that this new people, contending for liberty, just might prevail.